These sweet and sour chicken wings are baked in the oven to create a spooky fun Halloween dinner or appetizer. The wings are marinated in an easy asian style marinade of pineapple juice, brown sugar, tomato sauce and Worcestershire sauce. 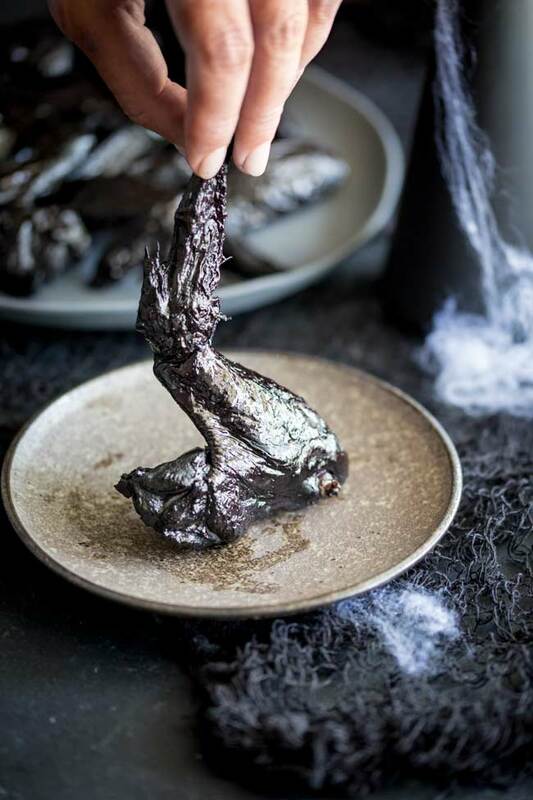 A dash of food colouring turns the chicken into ‘bat’ making these sticky wings an awesome savory addition to your halloween party. 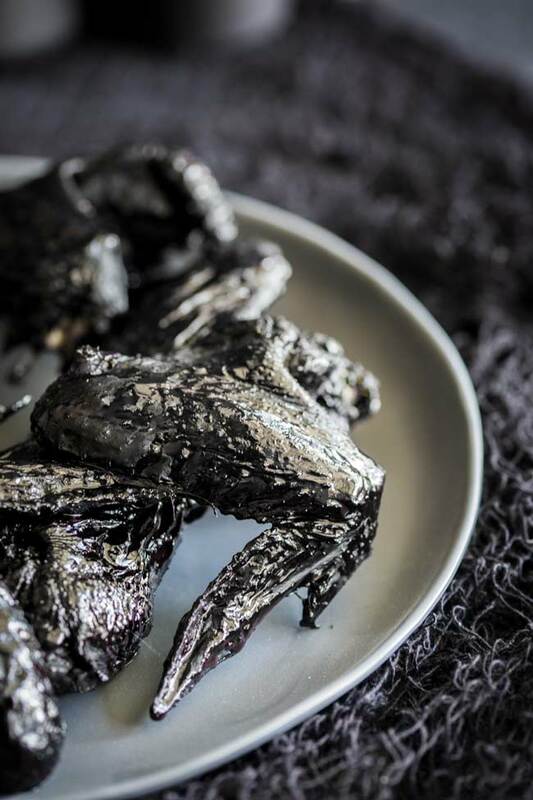 These spooky chicken wings are such a talking point. People either love the idea or hate it, but no matter what they all love the taste! It took me a while to convince the kids to try them, but once they had they loved the flavor. These are sweet and sticky with a little vinegar tang. There is the optional addition of hot sauce in the marinade. For the kids I just add a drop or two, but for a adults halloween party I would add a nice tablespoons worth. Once the wings are cooked they are glazed with honey and apple cider vinegar. This gives them a sticky glossy finish and adds to the sweet and sour flavor. I know everyone hates the basting stage in recipes but don’t skip this step, it really does make all the difference. 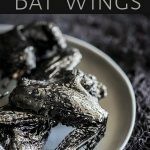 How do you make ‘Bat’ wings? To make bat wings you need to find whole chicken wings. Usually wings are sold as niblets where the whole wings have been jointed. Here you want the whole wing, and if you can get ones that still have the wing tip on as that adds to the bat-ness. I tried using squid ink and the color wasn’t quite as dramatic, but it is a natural way to go. And the kids didn’t notice any difference in taste. Can I just leave off the black colour? Oh for sure!!! This marinade is a quick pantry marinade so you can whip this up on a week night! If you don’t have time to marinate them overnight that is fine. Just throw the chicken and the marinade into a baking dish and cook everything together. This will help to deepen the flavours. But if you want the black colour then the wings do need a reasonable stint in the marinade. I like to use an old plastic bowl whenever I am using food colouring. That way I don’t have to worry if the coloring stains the bowl. So far the bowl has come up white again after a wash with hot soapy water…..my fingers aren’t always so lucky! I just can’t open those gel food coloring bottles without getting it somewhere! Be careful with the black food coloring, it is a killer to get out of your t-shirt (trust me I know!!!) and also if you get it under your finger nail you will be scrubbing for days and still look like you just finished digging up soil with your hands! That is why Stew had to be my hand model in this photo!! My thumb nail looks rather gross!!! I suppose that fits in with the Halloween theme, but it just looks too dirty for photos. 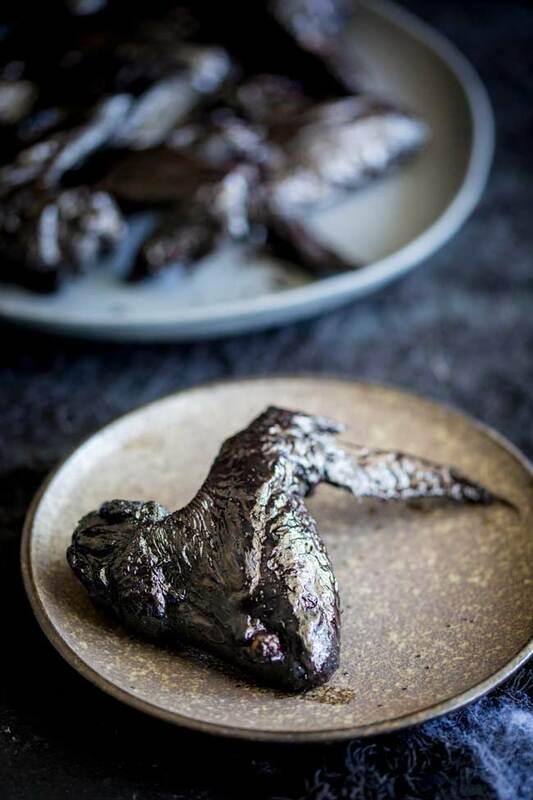 Once cooked the black doesn’t really transfer so you won’t have to worry about your guests all ending up with black fingers. But I would provide napkins or a finger bowl as these wings are sticky. 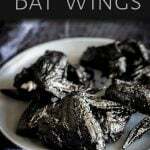 Why not pin this recipe for Sweet and Sour ‘Bat’ Wings. Pin it here. These sweet and sour chicken wings are baked in the oven to create a spooky fun Halloween dinner or appetizer. The wings are marinated in an easy asian style marinade of pineapple juice, brown sugar, tomato sauce and Worcestershire sauce. A dash of food colouring turns the chicken into 'bat' making these sticky wings an awesome savory addition to your halloween party. 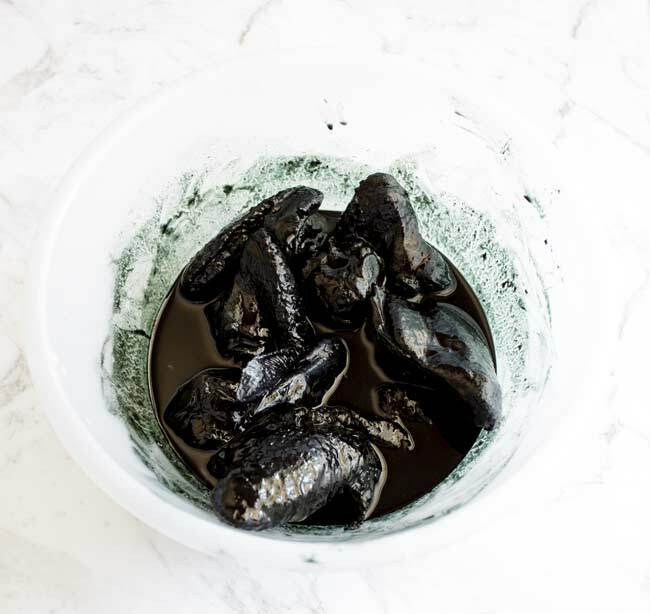 Combine the pineapple juice, brown sugar, tomato sauce, Worcestershire sauce and black food coloring in bowl. Add the chicken wings and turn carefully to coat. Line two baking sheets with parchment paper or a nonstick baking mat. Remove the wings from the fridge and place them in a single layer on the baking sheets. Combine the honey and apple cider vinegar. Remove the wings from the oven and brush liberally with the honey mixture. Find whole chicken wings (sometimes call 3 joint wings) rather than the chicken niblets. This is what gives these wings their 'bat wing' like shape. 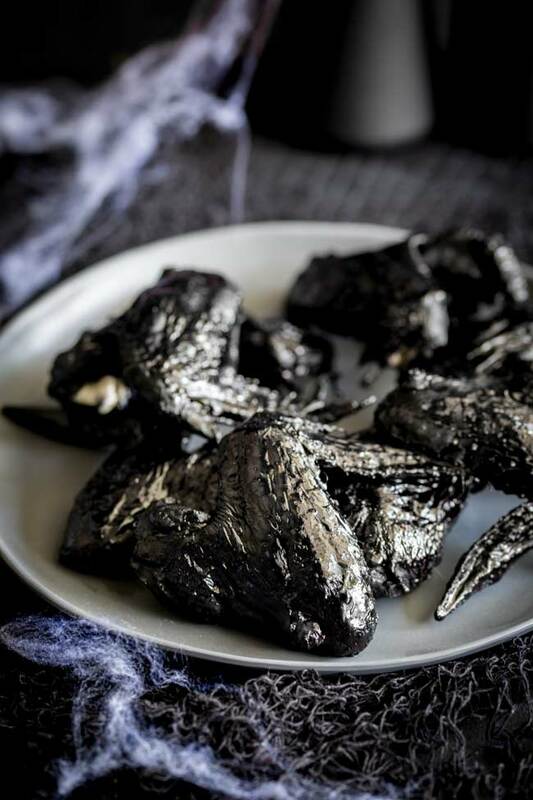 If you love food why not subscribe to my newsletter, I will drop you an email every now and then, just to say hi and send you a couple of recipes I think you might love, like these Sweet and Sour ‘Bat’ Wings. 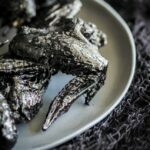 These are probably my favorite Halloween recipe I’ve found! Definitely making these for dinner this year if I can find the food coloring (well, I’ll make them either way!). I just featured this recipe on my Halloween Foods roundup on my blog! These sound fantastic! I would love to include them at my Halloween party. Can you suggest a substitute for the pineapple juice? I’m allergic to pineapple. I haven’t tried it, but I think any fruit juice would have the similar affect of adding sweetness and some acidity. Maybe try apple juice or mango juice. This recipe is so creative! And a fun twist on chicken wings. I can’t get over how incredible these look! What a brilliant recipe for halloween. Oh thank you Jennifer, I love how they turned out.